Welcome to our new GCCYS Boys Volleyball page. 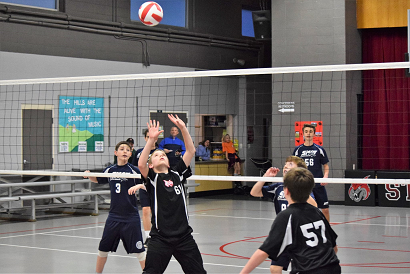 Whether you have a son playing in our league or you are a coach or coordinator looking for information about our boys volleyball youth athletics ministry, we hope that you find the information provided on this page useful. Scroll down to find information about the current season as well as metrics from last season. To participate in the GCCYS, we expect all parents, players, coaches, and referees to abide by the rules and behave in a manner becoming to our Catholic faith. Please take time to read the Rules document as well as our Sportsmanship document and Ten Things Parents of Athletes Should Know. Beginning with the 2018-19 school year, a single referee will be assigned to each match for all grade levels. Total payment for this referee is $26 (each coach should pay the referee $13 before the start of the match). In some cases, which will be communicated in advance, a two-referee system will be used for the season-ending tournament ONLY. For the Spring 2019 season, this will occur for the 6th-8th grade highest level only tournaments. In this case, each referee will be paid $26. One coach will pay the umpire/up referee $26 and the other coach will pay the down referee $26. In order for your child to participate in the GCCYS, ALL parents/guardians must fill out a Liability Waiver form for each of their children playing in our league once per school year. We try to help out our coordinators by matching up waivers with roster entries so please double check the spelling of your child's last name, verify date of birth, and make sure you choose the correct organization. Parents may begin filling out Liability Waivers for the 2018-19 school year on June 1st. Waivers are due by July 27th for the girls volleyball season. The spring season is scheduled different than most as we look to avoid playing on the weekend. Most of the matches are played on Monday-Thursday evening with start times between 6pm and 8pm. Some matches will be played on Friday evenings but the league will avoid scheduling matches on Saturday and Sunday. What net heights are used per grade level? Are awards given to division or tournament winners? Team trophies are given to 1st, 2nd, and 3rd place finishers in our post-season tournament. T-shirts are available for purchase for regular season and tournament champions. A Liability Waiver is an on-line form must be filled out by a parent or guardian for each player that wishes to participate in our league one time per school year. The purpose of the waiver is to release the league of any liability in the case of an accident or improper conduct by players, coaches, or fans. Each parish/school may choose to charge admission for regular season and post-season tournament games. Some choose not to charge or charge less than the league max which is $5/family, $3/adult, and $1/child. Updated 1/2/19: Please review the following timeline for the 2019 season. The season-ending league tournament will take place from May 13-17. We will work around parish conflicts as best as we can but there is very limited time available for this tournament to be played. All teams participate in the tournament unless they notify the league by April 30th. Schedules are published one week before the tournament begins. A team trophy is given to the 1st, 2nd, and 3rd place team in each bracket.